SEOUL, Oct. 24 (Yonhap) — The top United Nations official on refugees on Wednesday encouraged South Koreans to be “more hospitable” to asylum seekers to match a consistent rise in the country’s financial contributions to refugee causes. The government’s handling of hundreds of Yemeni people marked a “positive” step, at least in the short and immediate term, although they were not granted the refugee status, Filippo Grandi, U.N. high commissioner for refugees (UNHCR), said. Wrapping up months of screening last week, the Ministry of Justice gave 339 Yemenis staying on Jeju Island renewable one-year humanitarian visas. The authorities are reviewing the qualifications of 85 others. “They are fleeing the worst humanitarian crisis in the world. So for me, there’s one immediate concern that they receive protection,” Grandi said in an interview at the UNHCR office in Seoul. In that sense, he added, a positive result is that they were not returned to Yemen, where they would be at risk. He said his agency respects the South Korean government’s decision, as determining the Yemenis’ legal status is a matter of the government’s discretion. 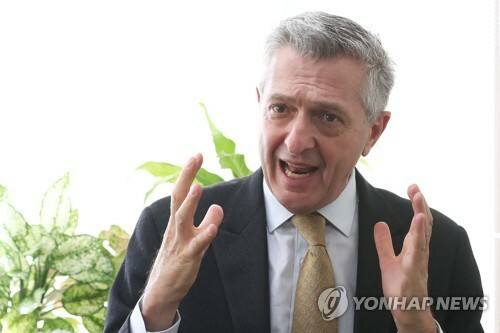 Grandi is well aware of the prejudices and negative views among some Koreans against the Yemenis and similar applicants for citizenship in the traditionally homogenous society. In his view, South Korea is already setting a meaningful precedent in Asia when it comes to the global refugee issue. The government donated US$21.8 million to UNHCR in 2017 alone, while individuals and corporate partners contributed $35.8 million, according to official data. The donations are expected to grow this year. It shows South Korea is becoming a more important partner of UNHCR in the region, a subject he discussed in a meeting with Foreign Minister Kang Kyung-wha on Tuesday. “I think it should be also matched by hospitality,” Grandi said. “Refugees are not a threat. They are threatened people. They need our help. They need our protection. Korea can give that. And they should not worry about crime, about violence,” he said. While there can be some “bad refugees,” no significant increases in crime rates have been reported in nations with accommodative refugee policies, particularly industrialized countries, like South Korea, he noted. The U.N. official also said if South Koreans treat refugees more hospitably, that could help send a more powerful message on North Korean defectors to the international community. He wouldn’t be drawn into a sensitive topic of China’s policy on North Koreans. “We don’t have access to North Korean refugees in China,” he said.